An herbalist and a Rottweiler solve a series of crimes. 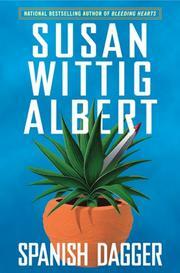 While picking yucca leaves for a papermaking workshop, China Bayles, herbalist, businesswoman and lawyer, discovers the body of Colin Fowler, local business owner, possible undercover cop and former love of China’s best friend, Ruby Wilcox. Ruby, who’s off in Fredericksburg moving her demented mother to assisted living, begs China to look into the death and take care of Colin’s Rottweiler. Everywhere China goes, she crosses the path of a big blond guy whose looks mark him as a cop. Her pal, the police chief, warns China off, but all the clues seem to come her way. With her ex-cop p.i. husband out of town working on a cold case for her half-brother, involving the death of her father, China feels free to take chances with the blond guy, who may be a member of a regional Drug Task Force, a group with a bad reputation when it comes to corruption. He’s hunting for drugs, and he claims Colin was dealing. Colin had recently received calls from Lucita, bookkeeper at nearby Sonoma Nursery, presumably about some potted plants in Colin’s yard. But when Lucita is the next victim and Rambo the Rottweiler sniffs out cocaine in the pots, China realizes she may be in big trouble. Albert’s 16th (after Bleeding Hearts, 2006, etc.) complements the obligatory herbal lore and recipes with one of her best mysteries to date.